What you need to know is that we told Lexie she may get a little brother. It’s a delicate balance, not wanting to get her hopes up too high. But in all fairness, we had to tell her. Since Lili died, she has gracefully matured into an elder dog, easily ruling the roost. She controls the couch, and easily snatches a mouthful of Pink’s wet cat food before I shoo her away. Lex trots into the yard when she wants, plopping down on the perfect swatch of grass to soak up the sun. 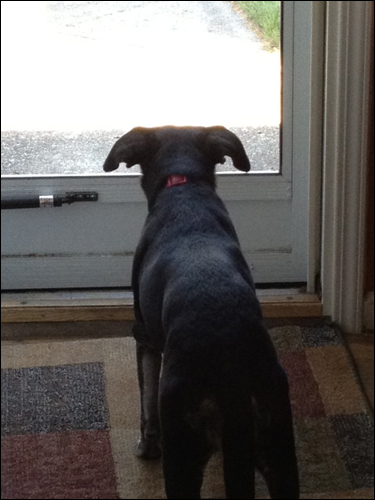 Lex waits for her little brother to arrive. All of that will change if Scout joins the family. Lex is OK with that. In fact, she’s sure of it. Since Lex has it so together, that allows Matt and I to focus on prepping the house for tomorrow’s home visit. The biggest project we had to tackle was our fence. My neighbor to the west replaced my Wild West-style fence with a modern cyclone version a couple years ago. But my fence to the east is just terrible. The posts are wood, and completely rotted at the base. The chain link is all rusted, and the top is connected by rotted two-by-fours. Uuugh. Needless to say, the fence was swaying back and forth, and probably could be toppled by a rambunctious puppy. Matt and I did our best to fix this last weekend by pounding in tall metal stakes, then hooking them to the fence. Believe it or not, it worked. It now runs straight, and I think could withstand jumping by a moderately excited dog. Other things we need to do are obvious: clean the house, pick up the library and organize the spare bedroom. I even emptied the litter box last night, a task alone that surely should earn me a new puppy. Also, we need to wash up the medium-sized crate. My large-sized crate already is clean and prepped, from when we thought we would have Ranger. But it seems way too big for a puppy. In all the hub-bub, I forgot to ask a couple important questions. Like how big is Scout? Is he crate-trained? Sheesh. I don’t even know if he’s housebroken. This whole thing is quite a mystery. Last night, Matt looked me dead in the eye and asked what we would do if we didn’t like him. I told him there was no way that would happen. But worst case scenario, I guess we could ship him back on a round-trip car ride to Kentucky. That thought made us sad. We agreed something terrible would have to happen for us to not take him. And chances are, even then we couldn’t be swayed. We are ready to welcome Scout home. This entry was posted in Adoption, Woof! and tagged adopt, cat food, crate, dog, fence, kentucky, Lexie, michigan, puppy, rescue, scout by ourfureverfamily. Bookmark the permalink.